Glass 4 Classics - About us. The team behind the business. While sourcing glass for their own vehicles they found that it was not always obtainable and there was an obvious need for quality automotive glass. So they did what many car guys do…they started a business. They are doing what they love and are helping people with the same passion as them! They have grown the business at a measured pace, trying to ensure that they don’t over promise and under deliver. From initially supplying just flat glass for classic cars, they now stock, import or manufacture, windscreens, side glass and back screens for most makes and models of cars from the early 1900s through to the 1970’s. Travelling thousands of kilometres each year they try to visit as many of the major swap meets, hot rod and car shows as they can. It is at these events that they learn what the most recent trends are and what, if any, problems restorers of old cars are facing in sourcing glass for their vehicles. 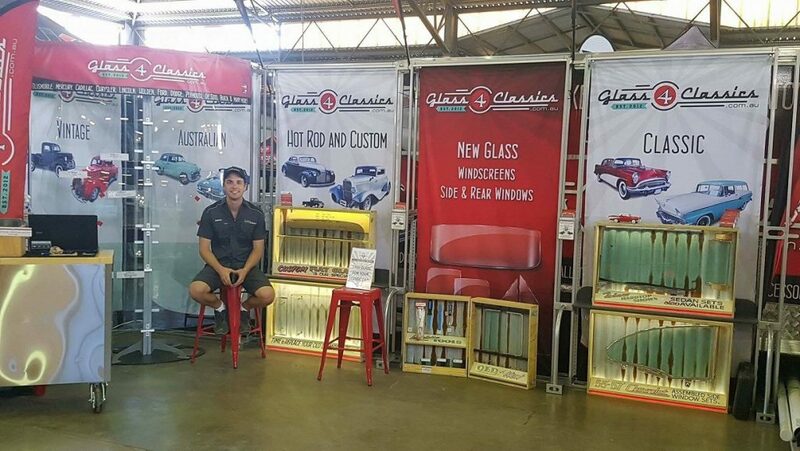 Ballarat Swap Meet 2017 Glass 4 Classics Stand. They have spent considerable time with manufacturers and suppliers, establishing a standard that they believe is acceptable. Glass that is of poor quality or does not fit will never be acceptable. The message must be getting through, as they are frequently accused of placing unacceptably high demands on them. It’s nice to hear they believe their demands are high. The good news is they don’t compromise and the standard being produced is now very good. CNC processing completed. 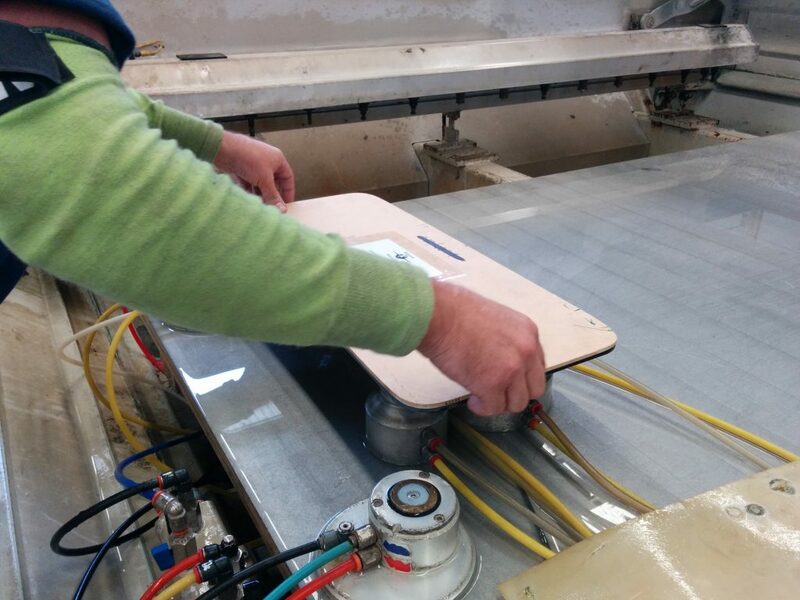 Each piece must be checked for accuracy against the supplied template. Commencing supplying flat glass for a limited range of Australian vehicles, having listened, they are now trying to stock what is not always readily obtainable in Australia. 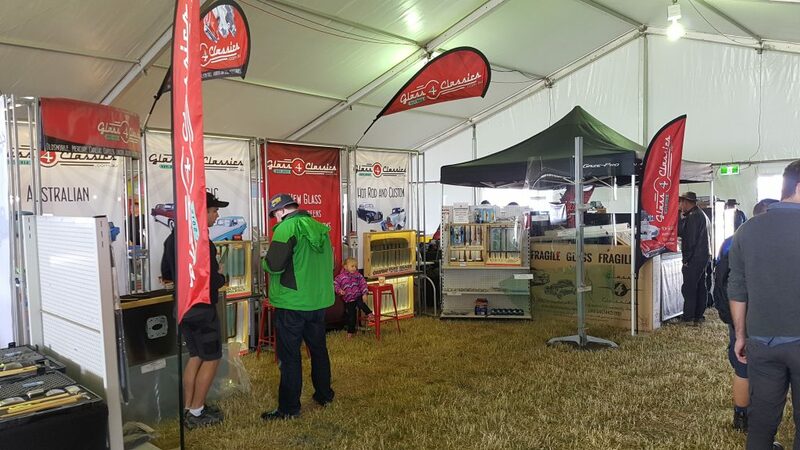 Their range of glass includes, windscreens / windshields, side glass and back glass for the majority of cars, trucks and pickups made in Australia or overseas, from the early 1900s, through to the late 1970’s. Their glass is either sourced or manufactured here in Australia or imported in large shipments from the United States. What if the glass you require is not reproduced, and you don’t have original glass.? Glass 4 Classics now hold patterns and templates for an estimated 8000 makes and models of cars. These patterns are backed up by an extensive library of glass related catalogues and literature going back to the early 1900s. Along with Nathan’s own exceptional knowledge of these vehicles, there is not much they can’t assist with. They may not always have what you are after in stock, however they will do what they can assist you source or have it manufactured. This is especially true for those who require custom glass for that chop top, hot rod or custom vehicle. Many of you are building custom cars, utes, trucks etc. requiring new glass to be cut. One off pieces of glass that are seemingly impossible to get, is where they excel. At Glass 4 Classics they strive for perfection and will do everything they can to help you to obtain the desired outcome. Our glass is seen ( or not seen if it has been cleaned well ? ) in cars at all the major cars shows and events around Australia and even Detroit. The award winning Ford XB Falcon X Boss. Top 8 Detroit Motor show Riddler Award. Winner of all major awards in Australia. All glass for XBOSS was custom made by Glass 4 Classics. Throughout their years in the classic car scene, as they have worked on their various projects, they have met and been helped on countless occasions by many wonderful people. Many of these folk are now lifelong friends. They have learned a lot from others and if they can do their little bit in giving back to the classic car community, they are only too happy to do so.